St. Joan of Arc Chapel was constructed late in the 14th or early in the 15th century in southeastern France, near the city of Lyon. After the French Revolution, it gradually became dilapidated. Then, after the First World War, a brilliant young French architect and archeologist discovered the ruined chapel and decided to reconstruct it. In 1926 the chapel was acquired by a wealthy New York woman, Mrs. Gertrude Hill Gavin, and it was transferred to her 50-acre estate on Long Island, where it was used regularly for Mass and other services until her death in the late 1950s. In 1962 the Gavin estate passed into the possession of Mr. and Mrs. Marc B. Rojtman. The Rojtmans presented the chapel to Marquette in 1964, and had it dismantled and sent to the campus for the university to reconstruct. A fleet of trucks, each truck carrying 40,000 pounds, brought the chapel stones to Milwaukee, where the first shipment arrived in November 1964. After the material was stored for the winter and the ground was cleared, reconstruction on the campus started in July 1965. The chapel was dedicated on the Marquette campus on May 26, 1966. The 2015–2016 academic year marked the 50th anniversary of St. Joan of Arc Chapel at Marquette. Learn more about the history of the chapel and events held to honor the occasion. 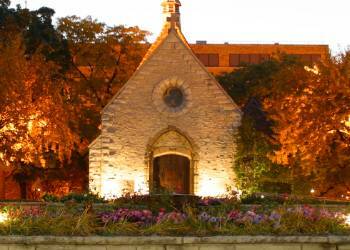 To schedule tours, call the Campus Ministry at (414) 288-6873. Tours last about 30 minutes. There is no charge for tours, but donations are accepted. (If the university is closed, the chapel is also closed). Monday–Saturday: 10 a.m. – 4 p.m. Note: No weddings or baptisms are held at the chapel.